Welcome to the Hotel Coronado! We recently returned from our summer vacation in lovely and scenic southern California. It truly was a great trip. Now I know you are wondering, where could folks who live in a fabulous and exotic locale like northern Ohio go that could possible compete with the excitement that is their daily lives. Well I’m here to tell ya, SoCal is the place. 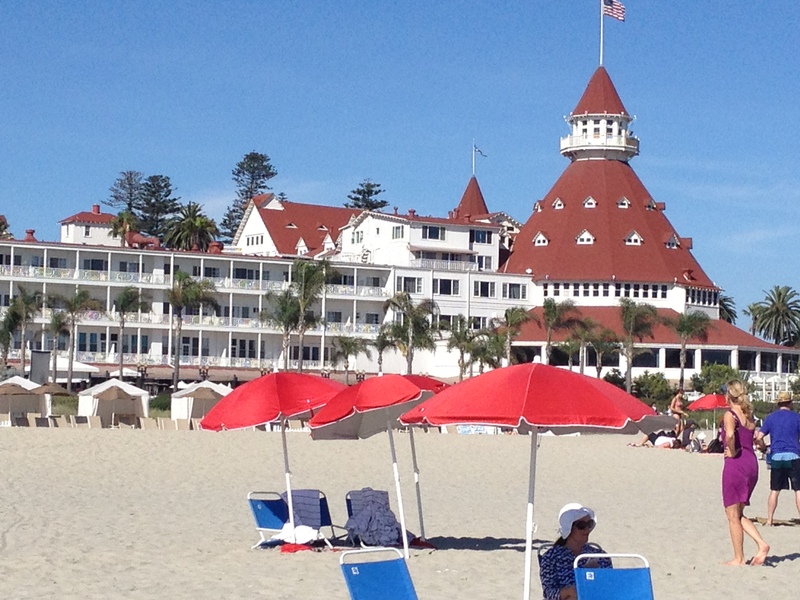 We stayed at the Hotel del Coronado on Coronado island just across the bay from San Diego. It is an iconic hotel best known for being the backdrop in the Marilyn Monroe film, “Some Like it Hot” With its sprawling grounds, painted white wooden exterior and red roof, it is quite a sight. “The Del” as it is called, relies a little too heavily for my taste on its connection to the movie and the fact that author L. Frank Baum, used to stay there. The gift shops have complete Marilyn Monroe and Wizard of Oz sections full of useless trinkets and do-dads, and Some Like it Hot plays non-stop for those who have not seen it. A word of caution, the movie is in black and white which freaks out the kids a bit. That aside, it is still a seriously awesome place. Since it is an older structure, it has it’s quirks. For instance, it smells faintly of litter box, which we determined was just the old wood because we saw no cats, and frankly, it made us feel better about our house which often smells similarly. Now I know it is the smell of historic distinction, and is not gross at all. Another quirk, they have this really old elevator which is odd for a number of reasons. It is tiny, encased in a decorative cage and only goes up three floors. It is also really slow, I was able to climb three flights of stairs with a child and full regalia of luggage in less time than the elevator took to get to the second floor. Further, it is manned by an operator who wears a hat that makes him look not unlike one of the flying monkeys in the Wizard of Oz. The elevator operator is featured in Some Like it Hot, and, judging by the age of the man we saw, could easily be the same guy. 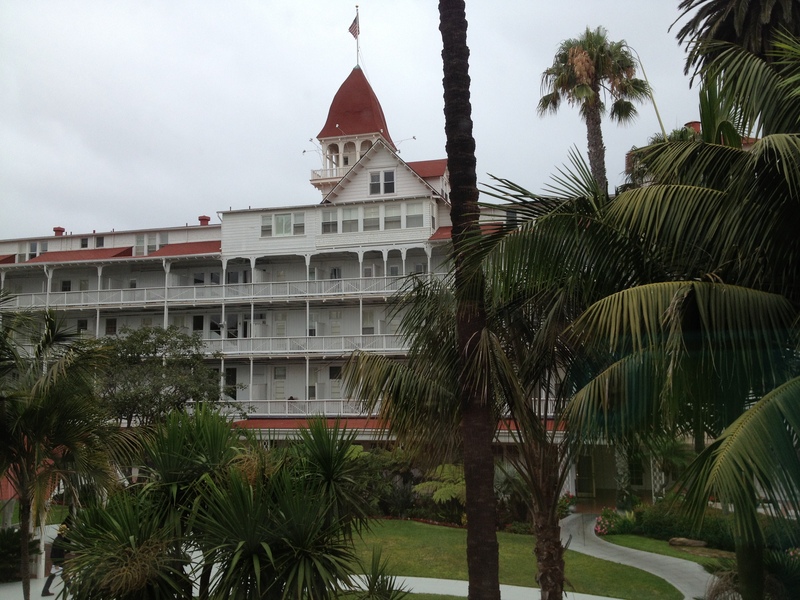 The Hotel is supposedly haunted, although we found no evidence of this. Lil’ Mayhem was on the lookout for ghosts and unless you accept the fact that the TV in our room fizzed out at odd times, she was unable to confirm any paranormal activity. This came as both a great disappointment and relief to her. A few other things I learned from my time at the Del. The ocean is cold, I mean, seriously cold. Beach yoga is windy and dangerous, the sand is not a stable base, therefore face plants and pulled muscles are a real possibility. The $25 a day resort fee is in addition to the $31 a day parking fee, and renting a sand bucket will set you back 7 bucks, 10 if you want the shovel too. And finally, it is possible to accidentally spend almost $100 on a glass of wine, a bottle of Belgian Ale and butterscotch pudding. All valuable life lessons.